Don't Buy A Pop Up Stand Without Talking To Us First. We will ensure you make the best possible choice in terms of model, quality, size and fit! We want to make sure you choose the right display for you! So Don't Buy a Pop UP Stand Until You have Spoken to Us! 1. What size is the area you need to cover? 2. What shape of Backwall is required? 3. What type of print media would you like to use? 4. How often will your display need to be refreshed or re-branded? 5. Does your Backwall display need to be reconfigurable? 6. How portable does your backwall display need to be? 7. Will lighting be required for your display? 8. How will your Backwall be transported? Vanilla Is Not Right For Everyone! Just Look at These Options! a sophisticated display in minutes! Multiple frames can be joined together to create larger seamless. 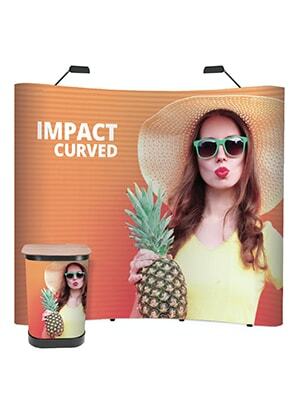 providing a simple and portable framework which can be dressed with a tensioned fabric graphic. the frame using graphic magnetic strips. Single or double-sided graphic option available and can be accessorised with lights and cases that convert to counters. This is a simple lightweight, collapsible frame with magnetic locking arms and push-fit fabric graphics. Coming in a variety of shapes and sizes, it is designed to be portable and durable and it can be set up and packed down quickly and easily. This great range of adjustable tension backwalls have telescopic poles for adjusting the height and width, so they can fit all spaces and graphic sizes. Composed of lightweight aluminium tubes which the graphics slide onto.